Can a car be too luxurious and Efficient ? We’re asking ourselves that question and the simple one word answer is 750 Li .It is The world's most luxurious and dynamic hybrid. 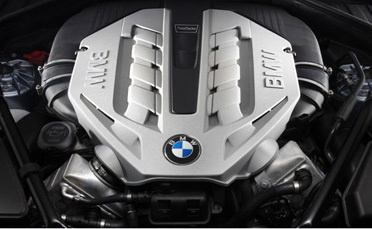 Under the hood of 750 Li , there is 455 horsepowerActiveHybrid V-8 engine with TwinPower Turbo technology having Rear-wheel drive. 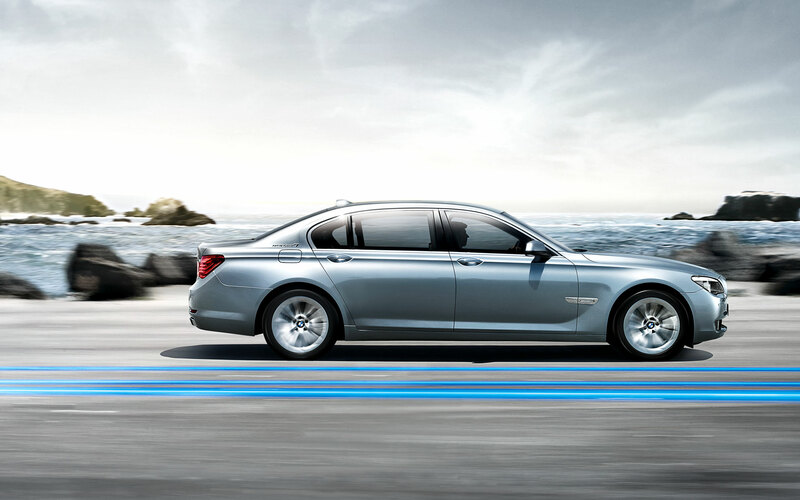 The BMW ActiveHybrid 7 perfectly combines comfort and dynamics in a luxury-class sedan. You are now able to finally enjoy BMW agility and dynamics in a hybrid vehicle with significantly lower fuel consumption and CO2 emissions. BMW ActiveHybrid is the intelligent combination of an electric motor and a combustion engine in a package ideally suited to everyday use and that provides increased and uncompromised driving pleasure as well as impressive comfort and spaciousness. The recipe for success for increased sports performance and groundbreaking efficiency at the top of the luxury class: BMW EfficientDynamics and the combination of the highly efficient BMW TwinPower Turbo V8 engine and the powerful electric motor that either provides additional power or generates energy when braking for the other electrical components or for the next boost. 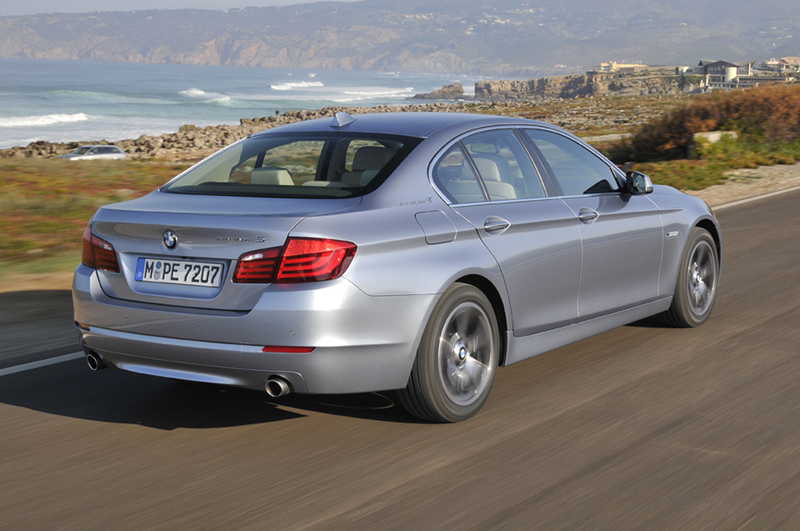 The BMW ActiveHybrid 7 is equipped with all BMW 7 Series innovations and is also available in a long version. The 8-speed automatic transmission quickly and easily switches with the integrated electric motor. The additional gears reduce the engine's increase in revs each time you change gear, guaranteeing a quieter ride and increasing efficiency. The eighth gear reduces the revs at high speeds, improving comfort and reducing consumption. The ActiveHybrid 7 is powered a state-of-the-art 4.4 liter turbocharged V8 engine producing 400hp and 480 ft-lb of torque. Its top Speed is 250 Km/h and the acceleration is 0-100 Km/h in 4.9 sec . Now, you’ll be able to take your foot off the gas with a smile, because the BMW ActiveHybrid 7 electric motor acts as a full-fledged generator when coasting and braking. BMW Approved Cold Weather Tires have been specifically formulated to combat the reduction in traction that occurs when the temperatures drop below 45°F. 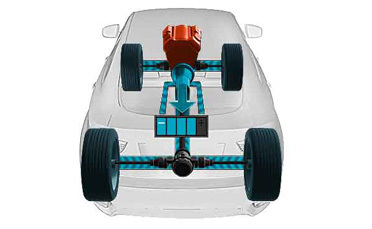 An optimized balance between physics and chemistry provides the superb grip that's required to keep your BMW performing like the Ultimate Driving Machine on all adverse road conditions in virtually all weather. If it's the driver's job to drive, it's the passenger's job to relax. To that end, we've made the rear seating more comfortable and spacious than ever. The ActiveHybrid 7 enjoys a longer wheelbase and a noticeably larger door to make it easier to enter the vehicle. The interior space is the most generous in the luxury sedan class with a redesigned roofline for additional headroom. The climate control system in the BMW ActiveHybrid 7 is supplied with power directly from the high-voltage battery, thus ensuring all the usual functionality regardless of whether the engine is running. When the ignition is off and the doors are closed, the only hint of the advanced technologies and entertainment systems along the smooth, black panel are the raised chrome gauge rings and needles. When the door is opened, the gap at the bottom of the chrome rings fills in graphically, and the dials and other displays begin to become visible. Once the engine is started, the black panel instantly comes to life. Where before the display’s borders were ambiguous, now the screen is clear, displaying onboard information and controls with intensified clarity. At night, the instrument panel displays change color from white to BMW amber. The exterior of the BMW ActiveHybrid 7. The BMW ActiveHybrid 7 goes its own way – even when it comes to design. The discreet model logos on the C pillars and boot as well as the 19-inch Aero wheels Streamline perfectly express the vehicle's exclusive individuality. On both the normal or long version, with a 14 centimetre longer wheelbase, the large kidneys immediately indicate the power and presence that lies within. The distinctive rear rounds off the BMW ActiveHybrid 7's overall athletic appearance and underlines its pioneering character. Dramatic wood trim accent pieces add style across the dashboard, doors, center console, and cup holders. The subtle intensity of the trim encases an array of technological conveniences, including programmable memory keys, in-dash CD controls, the Black Panel LCD screen, center console shift lever, and the new iDrive. Nappa leather adorns both doors and the 20-way front comfort seats. Interior design also brings an ambience of well-appointed style with a leather-covered, double-lid storage compartment. Of course, the style isn’t without purpose. In addition to storage, it also acts as a supple armrest for both driver and passenger. All information, entertainment and comfort features are controlled via the enhanced iDrive system. The new system features a larger, 10.25-inch, high-resolution display; more intuitive controls; and four direct-entry buttons for accessing radio, CD, telephone, and navigational features. Furthermore, the integrated Hard Disk Drive offers an ample 12 GB of storage for importing your favorite music from CDs, MP3 players, or USB sticks. Compared with its competitors, the ActiveHybrid 7 iDrive offers superior ergonomics with a high-mounted display and center console controller. All this ensures drivers’ eyes stay on the road, not on the screen or controls. 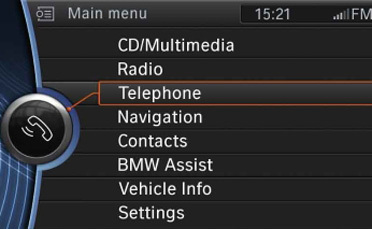 Beyond the standard functions, the iDrive system also accesses BMW Assist® services. The BMW Assist Safety Plan—included for four years at no extra costs—offers an arsenal of safety, security, and convenience services. Trained response specialists are available at the touch of a button, ready to provide you with enhanced roadside assistance. The system also includes Bluetooth® hands-free calling capabilities with speech recognition. Partnering with Google™, ActiveHybrid 7 drivers can save time by sending a destination from the Internet directly to their BMW before beginning a journey. MyInfo allows drivers to upload business listings, street addresses, and phone numbers to the all-new ActiveHybrid 7 for immediate navigational assistance. Drivers can also search Google maps from within the vehicle by subscribing to the optional BMW Assist Convenience Plan. With ''BMW Search,'' users can quickly find desired businesses through Google's powerful search engine. 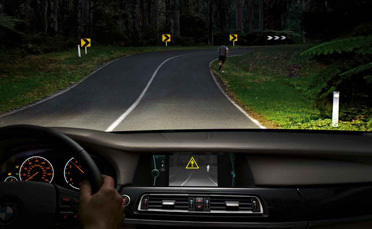 Optional BMW Night Vision allows drivers to see animals and pedestrians over 900 feet (or 300 meters) ahead—in the dark. Utilizing infrared technology from the vehicle's built-in, front camera, the ActiveHybrid 7 displays potential road hazards on the navigation system monitor so that drivers might avoid them well before they are visible to the naked eye. In the ActiveHybrid 7, Night Vision Pedestrian Detection technology distinguishes between animals and humans and alerts the driver accordingly. At a closer range, it identifies their position and the direction in which they are moving. If a pedestrian approaches or crosses the road, thermal imaging technology alerts the ActiveHybrid 7 system to display a symbol in the control panel and, if equipped, on the Head-Up Display. Looking forward isn't just a metaphor for our insatiable desire to innovate. It's also quite literal. The available Active Blind Spot Detection system helps eliminate blind spots to avoid collisions when changing lanes, literally keeping your gaze straight ahead. Using radar sensors at the rear of the vehicle to monitor the traffic behind it, this system alerts drivers if a vehicle is in their blind spot by displaying a light on their side-view mirror housings. And on the chance the driver does not notice the warning and signals to indicate changing lanes, the light on the mirror housing begins to flash and the steering wheel vibrates.